SPRAYING FOR CLOVER MITES – WHAT LEVEL DO YOU HAVE? CLOVER MITE TREATMENTS WILL TAKE TIME TO WORK! Clover mites began to surface as a residential pest in the years following world war II. This is when the great housing boom began to place plants and landscaping close to houses. Though this new look for homes was nice, it introduced environments that several insects, arachnids and other creatures like as well. This lead to mites living alongside homes which in turn lead to them finding there way inside. Much of the demand for pest control service is based on the fact that pre-existing conditions around the home are conducive to insect or pest infestations. The clover mite is such a pest. Clover mites are plant eaters. They can eat many types of plants, trees, mold or algae. Clover mites are strong and hearty. They will easily endure a cold, long winter and will emerge on the first warm day of January. Clover mites live on or close to the food they like to eat. So if they find a food supply on your home, they will quickly move into the siding. They like wood such as cedar, pine or pressboard. And they love vinyl or aluminum siding as well. They will live in all the cracks and crevices siding provides. Its likely they will find mold and algae on which to feed in these cracks. Clover mites are egg layers and usually lay eggs at least once a year. Though they may lay their eggs on plants, they prefer to do so on behind tree bark or house siding. The eggs will hatch in the spring as larva and begin feeding immediately. The larva will pass through several nymphal stages before reaching adulthood. This will usually happen late summer and into the fall. In most areas, there is one generation that reaches adulthood a year. However, this generation is usually hundreds if not thousands of mites. Though small, they will utilize every space they can find. If allowed to nest on the side of your home a few years without being noticed, you will probably have quite an infestation by the time you find them. And for this reason ongoing treatments will be required to resolve the problem. Clover mites are a problem for several reasons. Since they can live in wall voids, under siding and generally out of view, many times their activity will go unnoticed for several years. During this time they will be reproducing and growing the in numbers. This can happen out of sight since they are able to find food in areas where you don’t look on a regular basis. At one point their numbers will be so large they will have to migrate. This migration usually happens in the spring or during a warm spell in the winter. If you have such a migration expect to see thousands and thousands of red specs running around in circles. This migration may start from plants or trees adjacent to your home. It may be originating from the siding and wall voids of your home. This migration will lead to them getting in around window and door frames. The mites are not looking for anything specific but they will be persistent. These migrations generally happen when the nest areas are filled up and they are simply looking for a new place to live. 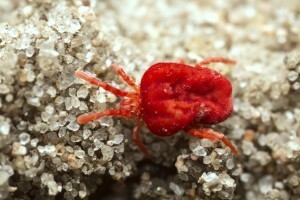 You’ll know you have clover mites because they smear red if you crush one with your finger. The following video shows what a clover mite looks like close up, what they look like compared to a persons finger and what they look like after they’ve been crushed by that same finger!! 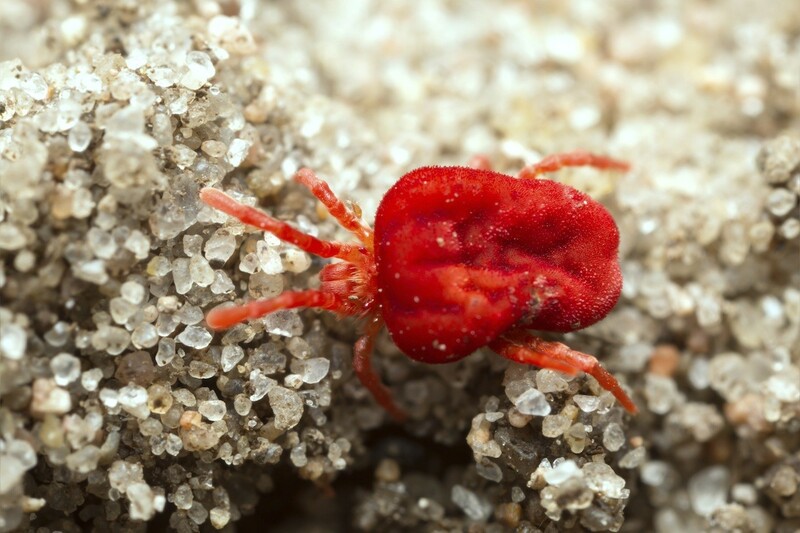 As demonstrated in the above video, The smashed mite will leave a red blotch. But this red is not blood. Clover mites don’t bite, but they will leave a mess. Their red will stain just about anything you smear them on so try not using the crushing method of control. It will prove to be easier to vacuum the active ones or to use a piece of scotch tape with light pressure. But clover mite migrations are the first clue you receive about a problem. Rest assured it will continue through the spring and then appear to pass as summer sets in. You may have another exodus in the fall, but they probably won’t appear in great numbers until warming days during the winter. These migrations and their populations will continue to grow unless you implement a pest control program designed to get them where they are living. Although you may find them randomly around the home, in most cases the migration occurs on one side of a home. It may be on the second level coming from the roof. It may be on the first floor on the southwest side of the home. It may only be on the outside of the house and even on just one side. If they haven’t gotten inside yet, you should be able to take care of the problem by outside sprays. But if they have found their way inside, you will need to attack them at both fronts. Its important to understand that the pest control program you set up will not be done just once. In fact clover mite treatments will generally be needed weekly until activity ceases. So expect to spray weekly to start and then every 2 weeks and eventually, once all activity is gone, once every 2-3 months if you want to make sure they don’t return. Remember, clover mites don’t establish themselves overnight and you won’t be able to get rid of them overnight. 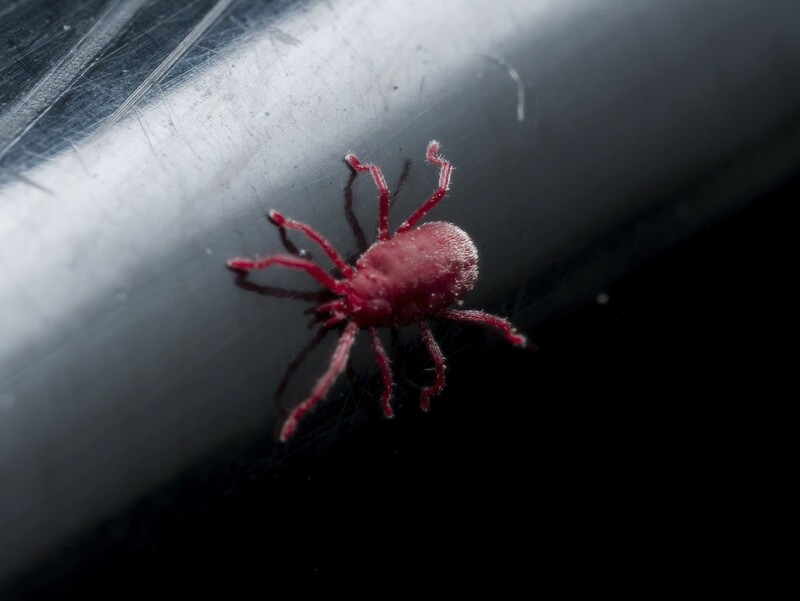 Level one infestations are when clover mites are found around the home on the outside. You may be finding them in mulch like pine straw or wood chips. Any natural mulch decomposes and will create enough food to feed a lot of clover mites. Rock or gravel beds around the home are excellent clover mite beds. The rock tends to hold moisture which in turn allows algae to grow. Clover mites will readily take advantage of this food supply. Fence rows, railroad ties and plants which are contacting or in close proximity of the home will all attract and provide both food and shelter. If you come home one day to thousands of clover mites active in any of the above areas, don’t be surprised. Be thankful they aren’t inside your home at this point. This activity should be controlled immediately so you can head them off before they become a major problem. 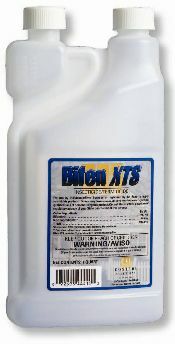 The best spray for outside treating is BIFEN XTS. It mixes with water at the rate of .5 oz per gallon of water per 1,000 sq/ft of area covered. Bifen will quickly kill active mites and provide a few weeks of residual. But only the first spray will kill them quickly. Thereafter active mites can take days to die so you will typically see some activity as more emerge from hidden areas. Now if you note a lot of new activity within a week of spraying, spray again. In fact its fairly common to spray once a week for the first few weeks to knock them down. Its fairly common to need weekly applications to knock down the bulk of the population so be patient. To apply the Bifen, you’ll need at least a good PUMP SPRAYER. So for a few flower beds or cement walkways around the home, 1-2 gallons will usually do the job. But if you want to treat the entire yard, go with a good HOSE END SPRAYER. Use 2 oz per 5 gallons of water per 5,000 sq/ft of area. Once under control, consider using granules for ongoing maintenance. These will prove easier to apply and longer lasting compared to the spray. Granules won’t work quickly but they will really help keeping clover mites and other pests away. 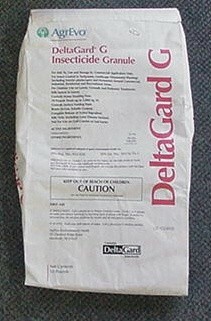 For clover mites, DELTAGARD GRANULES have proven to be every effective. Use 1 lb per 1,000 sq/ft; a 20 lb bag will cover up to 1/2 acre. For large areas, any good push fertilizer spreader will help apply them properly. For small areas, a SCATTERBOX is easy to use and can hold almost 2 lbs at a time. 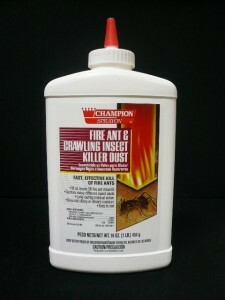 Its handy for treating around flower beds, landscaping, etc. Since the clover mites undoubtedly came from the yard, you’ll need to spray there as explained above. But during this treatment you’ll want to spray the side of the home too. If they’ve just started foraging onto the house, this should stop them. Be sure to spray at least 4-6 foot high around the home in addition to treating as described above. But if you see them 10 feet up, spray above and beyond. The liquid Bifen should keep them out, but for long term “permanent” control, you must attack them in the mulch, plants or other areas they’re nesting. If you fail to do this, they will surely find their way inside at some point as the foundation treatment will break down and be ineffective after a few weeks. This is why the Delta Gard Granules can be so important for long term control. Level three clover mite infestations are when you’re finding mites inside the home. This generally happens when the outside population has gotten so large they are foraging inside as they expand their nests. This might happen gradually, but in most cases homeowners come home to a migration in process. And don’t be surprised if this happens in the winter; this is a common time for the problem to arise. So if you see a mass of clover mites, don’t panic. First, step back and watch to see where they are emerging. This information will prove helpful for treatment. If you are seeing them outside, be sure to watch if they are emerging from the siding or from the ground. The two most important things to watch for is how high they are actively nesting and which side or sides of the home they are most active. Again, this information will prove critical when treating the outside with the Bifen. By knowing their main entrance points you will be able to treat them directly. So here’s a quick summary of how to proceed if you’re seeing them inside. 1) Treat outside plants and/or mulch areas that may be harboring populations with Bifen. 2) If you are finding them throughout the yard randomly when looking, treat the entire area first with the Delta Gard and then with the Bifen over the top as explained above. 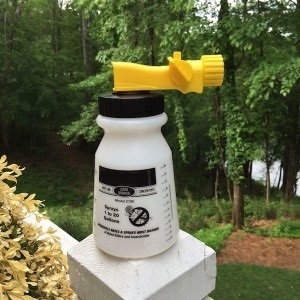 3) Spray the side of the home as well to a height above that which the mites are crawling. Use the Bifen for this application. Since level three infestations mean the mites are living in the siding and/or the walls of the house, the level of nesting can vary dramatically. You could get lucky and only have them in a small section of one side of the exterior of the home. However, this is not likely. In most cases, the clover mites will be very active on at least one side of the structure. This activity will usually be focused on 1-2 sides. But remember, it can be deep under the siding. Since homes have multiple layers of siding, it can be a challenge to reach them so its important to use the right material. 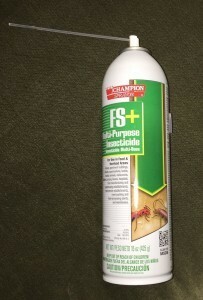 To start, try FS MP AEROSOL. 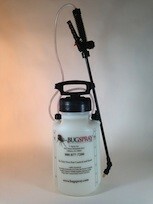 This fast working spray will penetrate deep into voids killing clover mites on contact as you spray. You will need to spray every crack and crevice you can see so don’t skip areas. Clover mites will span huge areas and if you see any on the south side of the home, treat the entire side. Another option is to use dust. This formulation will last a lot longer compared to an aerosol. A good choice for this is DELTAMETHRIN DUST. When applied up under siding and into voids, treatments can last up to 6-12 months – even in wet environments. 1 lb of dust can cover up to 500-1000 sq/ft so a little bit goes a long way. Like the aerosol, you’ll need to get it into all the gaps, voids and spaces. This is done with a HAND DUSTER. In summary, its important to realize that to control an ongoing problem with clover mites will take time. The problem doesn’t develop overnight and since it can get established deep in voids and other hidden locations, getting control can many times take a month or two. So if you have a level 1 or 2 infestation, outside treatments should do the job and keep them out of living areas. But once in the home, level 3 treatments will be required. And instead of 1-2 applications every 2-3 months, expect to treat weekly until they’re gone. Very Informative Site. Thank you so much for providing us this info! Great information, very helpful. Thank you very much. I’ll be calling.